When should footy fans lose hope? We all have our gut sense of when a game is lost. We look at the clock and calculate the number of minutes remaining and goals required, then work out if our team can plausibly come back. But when is a game truly lost, or won? 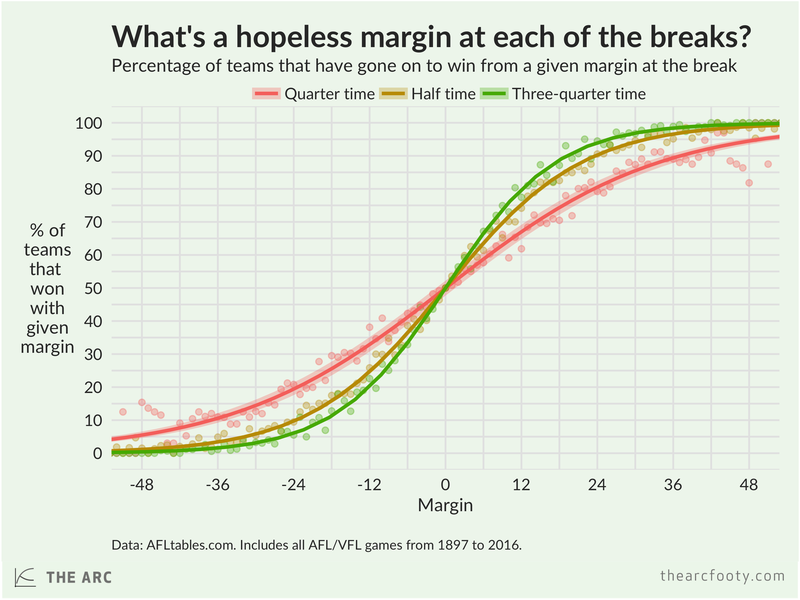 What’s a safe margin at three-quarter time, or half time? It turns out that, on average, a team wins nearly 90% of the time if it’s up by three goals at three-quarter time. A three-goal break at half-time results in a win 85% of the time, while teams go on to win 75% of the time if they are up by three goals at the first break. I’ve calculated these figures using every AFL/VFL game from 1897 to 2016. A natural question at this point might be: do games from the late 19th century really tell us much about the odds of a comeback in 2016? Has the likelihood of a comeback changed over time? 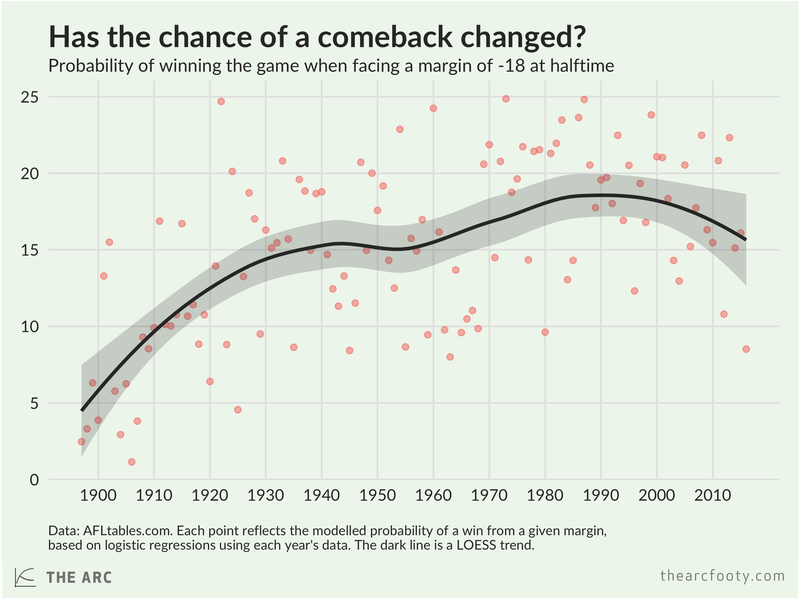 The probability of winning a game from a given half time margin has been remarkably stable over time. The only significant difference we found was for the first era of VFL football, from 1897 to 1919. In that period, an early lead counted for more – teams that were up by three goals at half time went on to win about 92.5% of the time, while the average for the other eras is just short of 85%. The probability of winning a game, given a particular margin at half time, has been remarkably stable between 1920 and 2016. 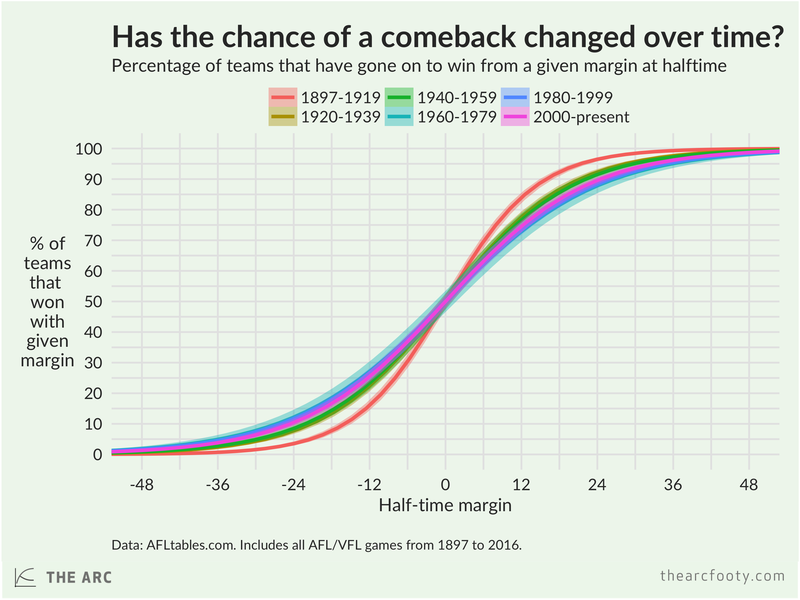 The chart below shows, for each season in AFL/VFL history, the likelihood of a team coming back to win after being 18 points down at half time. Each dot is a particular season, which the black line shows the trend. The figures bounce around a bit, but the trend is quite flat. Given the stability of the trend, we use all games from 1920-2016 to calculate our main charts, below. So far, we’ve looked at the average probability of coming back from a given margin. But the average conceals a big difference – the difference between home teams and away teams. 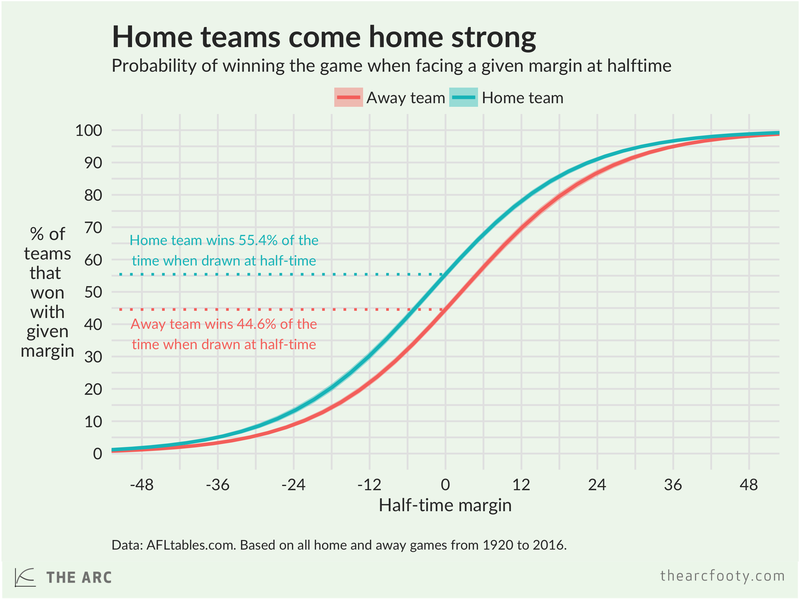 If two teams are drawn at half time, the home team goes on to win 55.4% of the time. 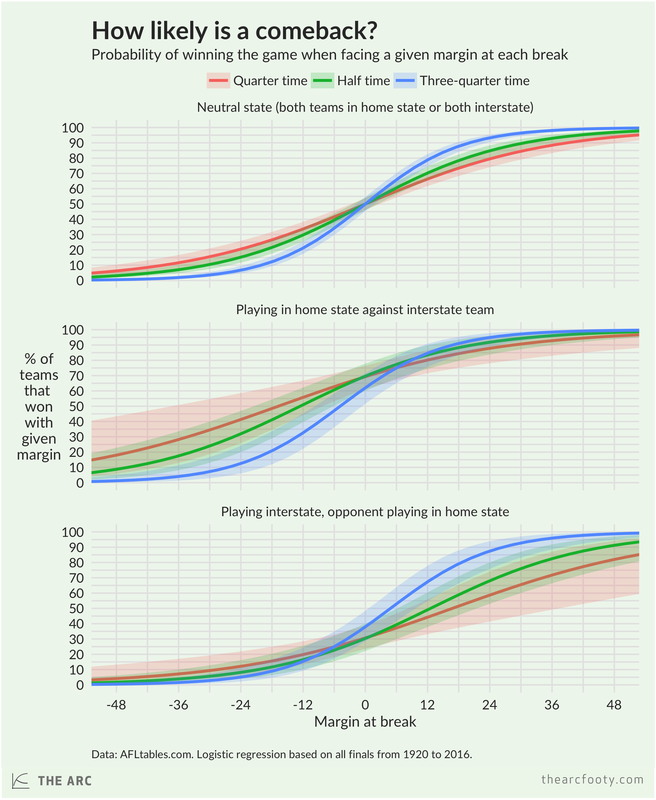 Home teams are more likely to come back from a given deficit and more likely to defend a given lead. 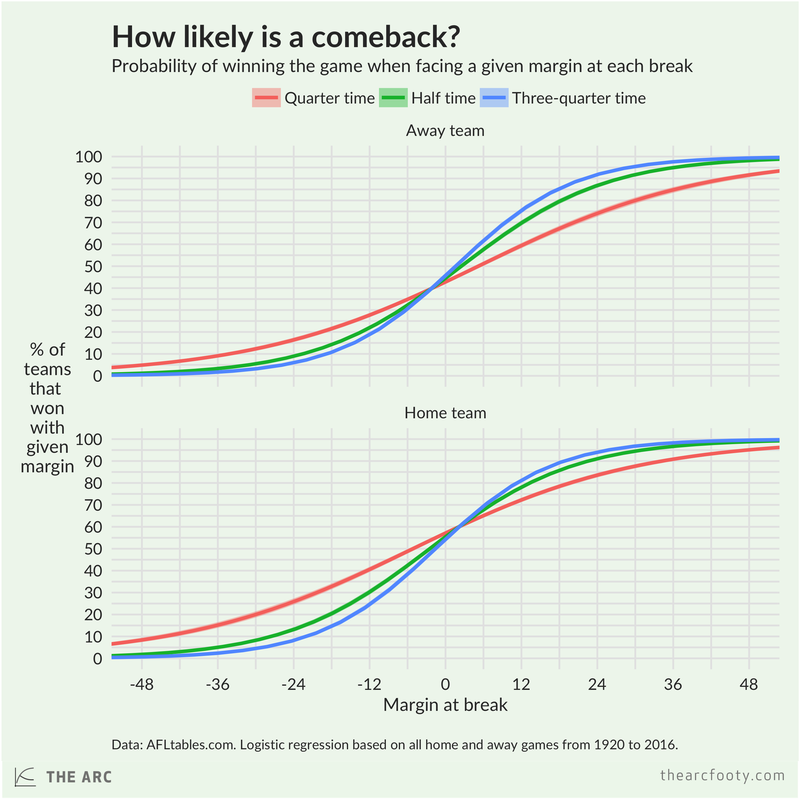 The graph below shows the probability of a comeback for a home or away team at each of the breaks. You can see that, on average, an away team needs to be up by about a goal at three-quarter time just to have a 50% likelihood of winning the game. For finals, we’ve looked at it a little differently. Rather than breaking it down by the designated ‘home’ and ‘away’ teams, we’ve split the stats up according to the state of the game. If both states are playing in their home state, or neither is playing in their home state, we’ve termed it a ‘neutral’ final. For finals where only one team is playing out of their home state, you can see that the host team is much more likely to win from a given margin at any of the breaks. However, the relationship between the margin at the breaks and the final result is more uncertain when it comes to finals between interstate teams, as we don’t have as many of them as other types of games. Next time you’re watching the footy and wondering whether your team is likely to win, you can consult these graphs. The two final graphs, the key graphs, will be posted on this easily-accessible page, which we’ll update with some more information soon. Note: These figures make no adjustment for teams’ quality.